As a reward for scanning my customer-loyalty card, Tesco has sent me some coupons to "help you save on the things you buy most often." Once I figured out what the best things were to buy, I basically bought the same things every time I went shopping. Of the 10 things for which they sent me coupons, 7 are things I frequently bought and 3 are things I rarely or never bought (depending on how you define the category). It can be a fun game to guess which are the 7 and which are the 3. As a bit of a cultural lesson for you, "home baking" is the way British people say "baking." Oh, and "biscuits" means "cookies." And isn't "fresh salad" redundant? Well, you get the idea. Living in England is more different than living in "the States" than I expected. There are many wonderful things about it, and several annoyances. It was my second (and last) run in Brussels. The first day, I'd gone to a rectangular park with a 0.8-mile perimeter and run around and around and across and around, and I was ready for something new. 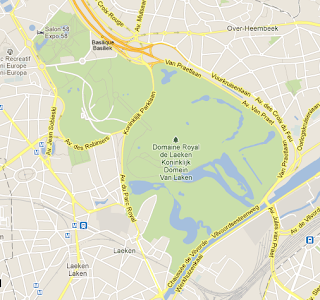 I had found a nice park on the map, about 1.5 miles north of my hostel, so I ran there. It looks nice, doesn't it? I could see the park, on the opposite side of a 10-foot-high brick wall, but there was no entrance. No problem; I would just run along the wall until I found the entrance. I ran along the wall for a few minutes, and saw no entrance. Hmmm. I asked a woman I passed, "excusez-moi, Madame, ou est l'entree du parc?" (where is the entrance to the park?) "Tout droit," she said (straight ahead). I must have looked surprised. "Tout droit!" Fine, I believe you. I went straight ahead, and there was a basketball court, but no entrance to the park itself. I kept going. Maybe it was further along, straight ahead. As I ran, I saw an entrance that had been completely bricked up. Hmmm, weird. Then I saw another bricked-up entrance. Very weird. I started to think that maybe the park didn't have an entrance. I passed some men doing yard work for the city. "Excusez-moi, monsieur, est-ce que il y a un entree du parc?" (is there an entrance to the park?) He pointed in the direction opposite the park, toward some houses. "Le parc?" "Non, ce parc." I pointed to the park that was 10 feet away on the other side of a high wall. He laughed. "Non!" He launched into a long explanation that I only understood about half of, including the word "roi." Wait, seriously? "C'est le parc du roi?" I asked. "Oui." "Seulement le roi peut utiliser le parc?" (only the king can use the park?) "Oui." Oh, man. That is so weird. He told me there was another park nearby. I went there. It was basically a long thin strip up a hill. I ran up and down it twice and then ran home. It was okay. Moral of the story: I have excellent taste in parks. A classic interview question is "Why are manhole covers always round?" Whomever created this question has clearly never been to Oxford. Oxford has the most amazing variety of manhole covers I have ever seen. Tiankai was extremely interested in the sizes and shapes of the manhole covers on the ground... When he discovered a new cover, he would become very excited... He would call out in Chinese, "Circular cover, square cover, big cover, small cover, big circular cover." I was surprised, because I had never seen a non-circular manhole cover. Then I came to Oxford. As a pragmatist, I wonder, "Why do they have rectangular (etc.) manhole covers?" because this allows the manhole cover to fall into the hole. Hardly practical. As a lover of symmetry, though, I am fascinated. So come with me, dear reader, as we explore the wonderful symmetries of the ground beneath our feet in Oxford. Three is my favorite. It's completely unexpected. Who would think of making a hole in this shape? It makes me wonder if this shape also has the property that it cannot fall into its hole. It does not appear to be a constant-width curve, but it reminds me of a bicycle polygon. while the circles of square dots have 8-fold symmetry. Hmmm. As discussed above, this is a little silly, because a square can easily fall into its own hole. Most of the square manhole covers go one step further and are cut into two isosceles right triangles, which makes it even easier for them to fall in. I tried to open this to see if there is a support across the middle, but it was too heavy. I guess that is why there is space for a crowbar on each side. This one has a nice pattern, but is again cut into two triangles. This one has an even nicer pattern, but is marred by the foul word FOUL. A round manhole cover! But don't worry; it still has awesome symmetry. It has five circles, with a cute little star in the middle to emphasize the point. Inside each of the five petals is a circle with 6-fold symmetry. Cool! It is basically the reverse of the awesome window I saw in Exeter, UK, below. 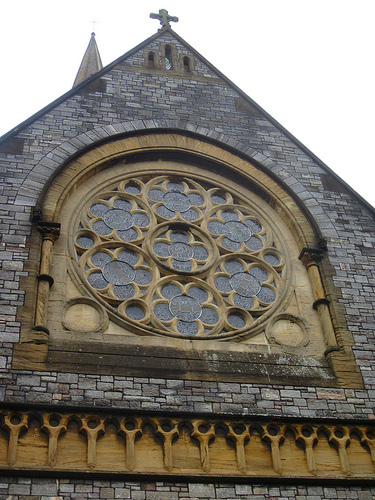 This window has 6 petals, each of which has 5-fold symmetry inside. If you thought the ones we've seen so far were cool, your mind is about to be blown. I was running in the dark with a group when we ran over a pentagonal manhole cover. That's right -- a pentagon. It was probably the most exciting thing that happened to me all week. It is about two miles from my house, and I ran back with a camera to photograph it in the light. In the light, it turns out that it actually has six sides. However, the sixth side is pretty small, so I'm still calling it a pentagon. The pentagon seems quite sensibly have a hinge, so that it can't fall into its hole. Circles pack well into six-fold symmetry. I think the manhole cover below has 50 circles. It's almost like two levels of a fractal. Pretty nice. This one is kind of dark, but it has 6-fold symmetry as a wagon wheel or ship's wheel shape. Wow, seven! Actually, these are not as rare as you might think. I have seen these same manhole covers with seven circles in several places around England. Seven is surprising. You rarely see things with 7-fold symmetry. Well, uh, unless you're in the UK and you pay for things with coins. 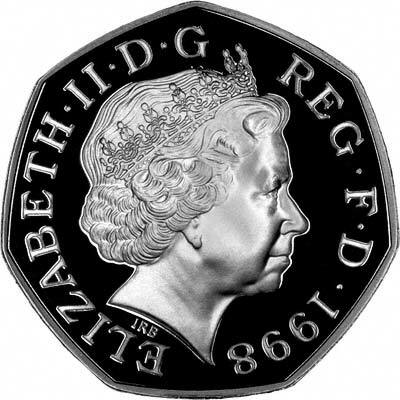 The 20p and 50p coins are constant-width curves with 7-fold symmetry. Octagons have a special place in my heart. Unfortunately, there are not very many octagonal manhole covers. The one below is the closest I have found. Picky people might even say this only has 4-fold symmetry. This is not an octagon, but it does have nice 8-fold symmetry. I haven't found anything with 9-fold symmetry yet. I'm still looking. This one is pretty cool. It reminds me of Islamic mosaics. With a little square in the middle that really should be a star or a pentagon. Yes, I did find a manhole cover that's just plain round. However, it has some pattern on it, probably for traction, which still exhibits (3-fold) symmetry -- that's a relief, isn't it? I hope you have enjoyed counting from 3 to 10 with me, as we walk through the streets of Oxford looking at the ground and not paying attention to pedestrians, cycles and cars. Please let me know if you have seen any awesome manhole covers, especially if they have 9-fold (or more) symmetry.